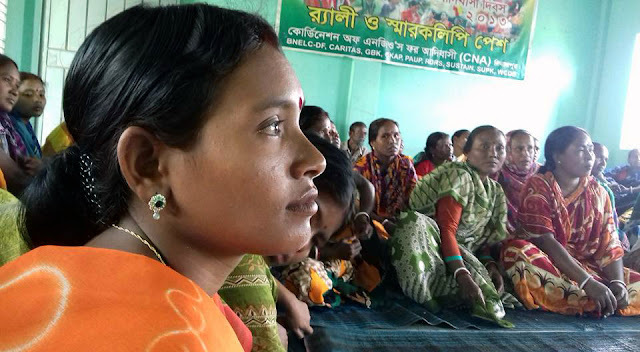 Four women groups from Mohalbari, Surail and Damoir villages in Northern Bangladesh participated in a two-day leadership and mobilization training in Dinajpur to spread the initiative of successful women-led cooperatives improving the livelihood of the rural poor. Among the 51 participants, most were landless women coming from Hindu, Muslim and indigenous communities. The training, organized by ALRD in partnership with SUSTAIN, is part of the project’s innovation plan that received ROUTASIA’s award of 2,500 USD last year. ALRD’s Innovation Plan entitled “Strengthening Women’s Empowerment and Livelihood through Access to Land and Market” was launched in July 2015, as a result of ROUTASIA’s Learning Route on women’s empowerment in Nepal’s Chitwan and Kapilvastu districts, in December 2014. With the financial award and technical assistance of IFAD-PROCASUR’s ROUTASIA programme, ALRD and SUSTAIN, its local partner in Dinajpur, are now implementing the plan in the northern region of Bangladesh, where the existing farmer groups are located. ALRD’s plan aims to secure equitable land access and control for marginalized landless communities, including farmers, indigenous peoples, religious minorities and women in particular, and to improve their livelihood through effective management of natural resources. Using local resources, local technology and indigenous knowledge, ALRD’s action plan integrated the People’s Initiative or “Gonoprochesta” model. This initiative promotes sustainable, small scale, family-based organic farming and rural enterprises, and provides direct access to land and market for disadvantaged communities, which in turn contribute to the country’s food security. The Gonoprochesta model empowers women by advocating their recognition at policy making level, and by enabling access to public land and to supporting services such as bank credits, agricultural inputs and technology, information and knowledge, and policy dialogue with government institutions. During the process, women are encouraged to create their own capital collectively, and to invest it in agricultural production of food and organic fertilizers. 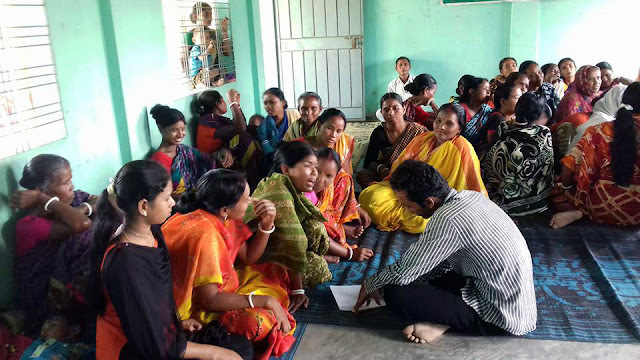 By transforming into People’s Cooperatives, the initiative sets a unique example to improve quality of life without external financial assistance. It also creates an alternative market for the products of small farmers and entrepreneurs united by cooperative groups, creating a wide range of employment opportunities in rural Bangladesh, particularly for women. In terms of diversification, cooperative farmers use different types of production, including agricultural cultivation (rice, vegetables, fish) and fertilizer production (earthworm compost). To analyze the socio-economic context in Bangladesh, the path of change and the participants’ respective roles in it, ALRD used a participatory discussion method. All participants agreed to the new vision of the People’s Initiative process promoting social and economic changes to improve their life and to protect their children’s future. They selected a name and a leader for each of their group, and they set up a work plan for the next three months. To create their initial capital, participants decided to save a handful of rice twice a day and to organize their weekly meeting on Fridays, where the saved rice is put on sale to generate financial resources for each group to be used for income generation activities. This collective way of farming enables them to use their small land as a homestead. It was also agreed that all activities would be monitored and guided by SUSTAIN, ALRD’s local partner organization.